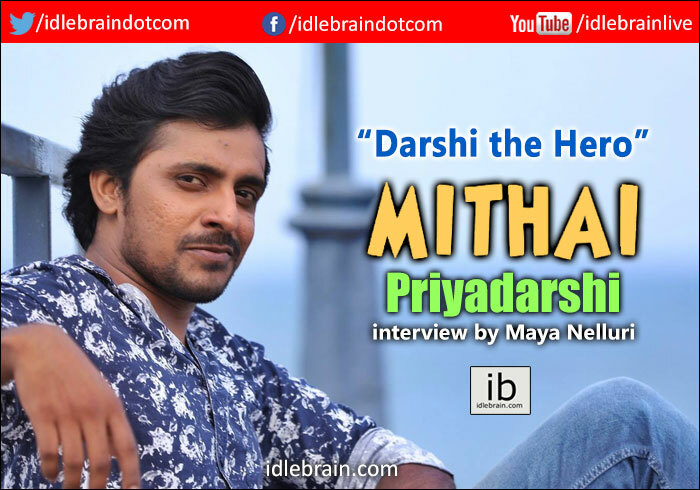 Priyadarshi or Darshi as he is fondly known, has become an integral part of Tollywood's comedy scene. His work in Pellichoopulu thrust him into limelight and just within a couple of years he's got a bunch of amazing roles under his belt. Now the actor is about to reveal a whole new side of himself playing a protagonist in the dark comedy Mithai and soon afterwards in the biopic Mallensham. Read on to find out about Darshi's experiences as an actor. How is Mithai different from your other roles? My body of work in comedy is mainly slapstick or punch based. Situation based comedy is less. There's usually a separate line of writing involved to add those scenes into the film. With Mithai it is completely situational. Also I wanted to attempt dark comedy which I haven't done before. We thought we could work together to explore it. How was it working with Rahul Rama Krishna? Our friendship goes back over ten years so it's much beyond movies. While working together we discoveres that we could seemlessly understand each other rather than needing discussions. It was very organic. We didn't need to develop timing and nuances. It just happened. How did you both become friends? In college we met through common friends. He was into journalism and social work by the time I was doing my mass communication. We used to bond over beer at tapeloop which was Vivek Sagar's place; it was a primary hub for all of us. Tell us about your role in Mithai. This character is basically laid back with no ambition. You can consider him an extended version of Kaushik from Pellichoopulu. The way the story grows with Sai takes the film on a whole new leap and dimension. It's basically a series of unfortunate events that happen to the protagonists. Is it inspired by any film or films? It's inspired by Coen brother's films but it's not similar or a copy of any work as far as I know. How are you expecting the audience to react to the film? I'm curious as to what they think. I'm expecting lots of laughter. If they go home laughing it's a success for our team. How did life change for you after Pellichoopulu? It has gotten me more work, better opportunities and I've gotten to work with industry giants. I've had a lot of chances to learn and explore; it's been a lot of fun. Essentially my work brings me everything. Some film's do well, some don't. All we can do going forward is make better choices and make better films. With your next film Mallesham you've veered away from comedy. Actually comedy, making people laugh, is very difficult. But it is very easy to get typecast if you do comedy. You have to do something big to convince people that you can do serious acting. I tried very hard to bring out the essence of the famous scientist in Mallesham. We have to see how it is received by the audience. As a team though we are kicked with how it's come out and we think it's a promising film. With Mithai and Mallesham you've moved from support roles to lead roles. Do you feel an increased sense of responsibility for the films now? It's not really a responsiblity because they don't run completely on me. Lot of stories are hero driven and Mallesham is protagonist driven but there's a lot of interesting characters which support the his journey. I'm also coming out of comfort zone to do different work. It tests us and it's a challenge. Our responsiblity is to uphold his legacy while playing a great human being. What sort of projects do you want to do going forward? As of now there's an upcoming film with me, Rahul and Sri Vishnu which is a crime comedy. It's an interesting film. In the end I want to tell good stories. I don't have any particular wants. Even Mallesham just came my way, I wasn't looking for serious roles specifically. If I can get people to believe in my work, that'll be great.